RIO DE JANEIRO, Jul 6 2013 (IPS) - The street marches in Brazil, initially non-party-political, have begun to take on the hues of leftwing political and social groupings, which are now trying to set the course of the movement that emerged from online social networks. Augusto de Franco, founder of Escola de Redes, a research group devoted to netweaving, said the movement that originated in large cities like São Paulo and Rio de Janeiro was driven like a “swarm of bees, a manifestation of interactions that could only occur in highly connected societies,” like what has happened in Madrid and other Spanish cities, or in Tahrir Square in Egypt. The demonstrations were triggered by one specific issue, a hike in public transport fares. But they have grown into the largest protests in the country since 1992, when demonstrations led to the resignation of then president Fernando Collor de Melo. This time the protests began with 5,000 young people and swelled to 1.5 million in 10 days. And they are innovative in nature, according to Franco. “They were not centrally organised, they had no formal leadership (although several short-term leaders emerged). They were not masses convened by centralised organisations, but multitudes of people that formed constellations,” he told IPS. The swarm, without a queen bee, is now in the middle of an “ideological tug-of-war,” according to João Pedro Stédile, leader of the Landless Rural Workers’ Movement (MST – Movimento dos Trabalhadores Rurais Sem Terra) which is now joining the protests. “Since young people do not have a mass organisation, the social classes have begun an ideological debate. They dispute the young people’s ideas in order to influence them,” Stédile said in an interview with IPS. “On the one hand is the bourgeoisie that used Globo (Brazil’s largest broadcaster) and other media outlets to put the right’s demands in the mouths of young people and on their placards. On the other hand is the left and the working class, that are trying to get on to the streets to push their own agendas,” he said. He listed factors like property speculation, which has raised rents and real estate prices by 150 percent over the last three years, and stimulation of automobile sales, which has led to “chaotic” traffic, without effective parallel investments in public transport. “Young people are not apolitical. They are doing politics in the best way possible, in the streets. But they are not linked to political parties. They do not reject the ideology of the parties, but their methods,” Stédile said. Sociologist Emir Sader offered other explanations, like utopian ideals, rebelliousness and “healthy disrespect for authority” that he said were characteristic of young people. “We are young and we want to be noticed,” said Farías. And their voices were heard by the executive, legislative and judicial branches, which have already come up with some short-term solutions, such as lowering transport fares, creating anti-corruption mechanisms, devoting more resources to health and education and debating a much-postponed political reform. 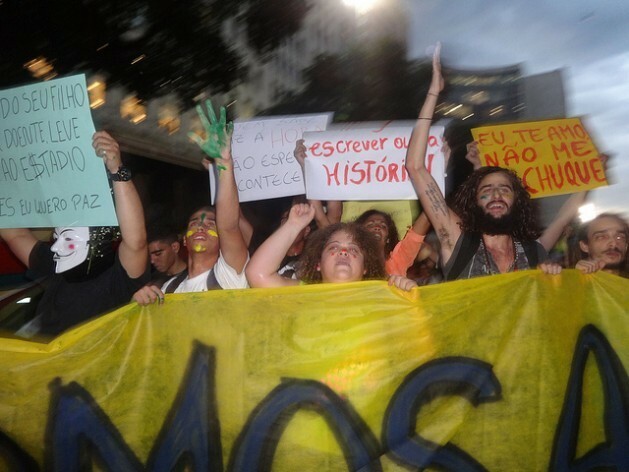 But the voices of the young have also reached the ears of social organisations and the wide spectrum of leftwing parties, including the governing Workers’ Party (PT) of President Dilma Rousseff. Another PT leader, former president Luiz Inácio Lula da Silva (2003-2011), himself urged it to join the protests. “The problem is how to mobilise the working class, because when it gets going it can achieve structural changes and strike at the interests of capital and the mass media,” he said. The strategy has already shown results in the most recent demonstrations, which have had more diverse demands and participants, including trade unions and movements for the rights of women, gays, peasants and indigenous people. “We are trying to mobilise the working class and include issues that are of interest to workers and all Brazilian people,” the MST leader said. In addition to increased public spending on healthcare and education, they are calling for a 40-hour work week and heavier taxes for the rich and a lighter tax burden on the poor, and for elections campaigns to be fully funded by public financing. And demands of a less urban nature are being raised, such as speeding up the demarcation of indigenous territories and land reform. Social movements have different issues on their agendas, such as suspension of mining concessions and oil block auctions. These sectors must regain the representational space on the streets that they lost over the last decade of government by a party led by a trade union leader like Lula, with his long track record and high prestige, with whom they identified but from whom they became gradually distanced. “The left in general became bureaucratic in its methods, although leftwing groups of young people in many cities were quite influential and were responsible for organising the protests,” Stédile said. This is a well-known strategy in Latin American history, which some analysts doubt is effective, while others support it. “This movement has an increasingly plural agenda. People are crying ‘enough!’ Although specific political groups are trying to capitalise on the movement, its outcome has yet to be seen,” historian Marcelo Carreiro told IPS. Trade unions’ and social organisations’ ability to call people out on the streets will be seen on Jul. 11, when they have convened a national day of protests and strikes. “We are aware that the media and conservative and rightwing sectors are attempting to influence the mobilisations with goals that are opposed to the interests of the majority of the Brazilian people,” said the Central Única dos Trabalhadores (CUT) central trade union, one of the 77 organisations behind the Jul. 11 strike. That is why “the organised participation of the working class is vitally important in this new scenario, to ensure a positive outcome for this situation,” it said.